Artist's illustration of 'Oumuamua, the first known interstellar asteroid. 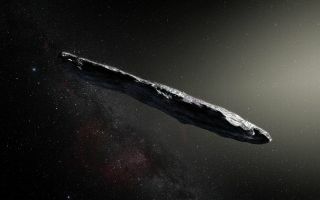 A year ago, astronomers spotted a strange object barreling through our solar system on a very weird path — the first discovery of an interstellar object, now called 'Oumuamua, which means "messenger from afar" in Hawaiian. During the abrupt flyby, scientists made frantic observations of the object before it passed out of range of even the most-powerful telescopes. Ever since then, 'Oumuamua has provided scientists a seemingly endless supply of questions, with most answers still very much up in the air. 'Oumuamua has also endured a bit of an identity crisis during its first year in the scientific literature. At first, astronomers thought it was a comet. Then, they realized there was no cloud of gas and dust enveloping the object, so they reclassified it as an asteroid. But that proved problematic when they realized it was moving faster than an asteroid ought to be, as if getting a little boost of speed from volatile materials evaporating off its surface, like those that form a comet's surrounding cloud. Another puzzle is the object's strange shape: long and thin, something like six times longer than it is wide. That's unlike most cosmic objects, which are generally lumps. It's also spinning strangely, tumbling end over end like a stick tossed for a cosmic dog. Some of the hypotheses to explain that elongated shape are that 'Oumuamua had a messy run-in with an asteroid or that the incredible gravitational pull of a giant planet stretched the object. But regardless of the mysteries scientists may never be able to solve with the observations they did gather in time, one thing about 'Oumuamua is nearly certain: It's not an alien spaceship broadcasting back to its creators. Yes, they checked.